This is a completely different and unique holiday gift for that golfer who has everything. 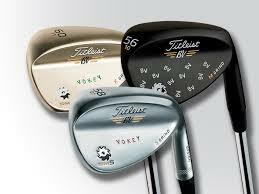 This package includes two custom made Titleist Vokey wedges which will be custom fit during a scheduled wedge fitting. The wedge fitting will determine the ideal wedge loft, lie, bounce, and grind for the recipient. This package will only be available for a short time with a limited quantity available. Once purchased we will email you the certificate which you can print out and present. A limited number of certificates are available at our Independence Golf Club location. Please contact us if you have any questions or concerns. This package price features a savings of $100! This is a completely different and unique gift for that golfer who has everything. This package includes two custom made Titleist Vokey wedges which will be custom fit during a scheduled wedge fitting. The wedge fitting will determine the ideal wedge loft, lie, bounce, and grind for the recipient. This package will only be available for a short time with a limited quantity available. Once purchased we will email you the certificate which you can print out and present. A limited number of certificates are available at our Independence Golf Club location. Please contact us if you have any questions or concerns. This package price features a savings of $100! Hodson Golf Gift Certificates – NEW! !